I'll do these in no particular order; ranking the 20 would delay this entry even more. I'll link to the posts in which these first appeared for reference purposes (that's also where you'll see which ones I got as review samples). Only one creme made the cut: SinfulShine Wisp. It's on the list because affordable two coat whites can be hard to find, and I've been looking for one since Sally Hansen discontinued my staple, Whirlwind White. Wisp even passed the stamping test (I myself could use some more practice in that area). There are a few shimmers on my list. Essie Cashmere Bathrobe. If it had been just a deep grey creme, it wouldn't have held my attention, but with those flecks of shimmer, I was on board. It's the same story with Oopsie Daisies Dionysus; I have plenty of juicy raspberry colored polishes but none amped up with coppery shimmery like this. I do have lots of plummy purple shimmers, yet I could not resist putting Sally Hansen Diamond Strength Private I on my list. I suppose with as many colors as Sally H. puts out each year, some are gonna be winners. I debated about OPI This Gown Needs a Crown, too. In the end, it made the cut because it's not like all my other silvers; this one is softer, with a sort of quiet blingy-ness. If I would have gone with two silvers, Zoya Seraphina would have been the second one. Orchid Seemed Like a Good Idea At the Time was in no danger of getting knocked off the list; it's purple with multicolored sparkles, so has two major points in its favor off the bat, plus its foil finish gives it a unique twist among my purple sparkly polishes. I consider nail polish part of my entertainment budget, and Ruby Wing Electric Firefly was very entertaining, transforming from neon acid yellow indoors to tangerine in the sunshine (it's in mid-morph below). It was such a good year for holos that I had a hard time narrowing it down to just a few colors. 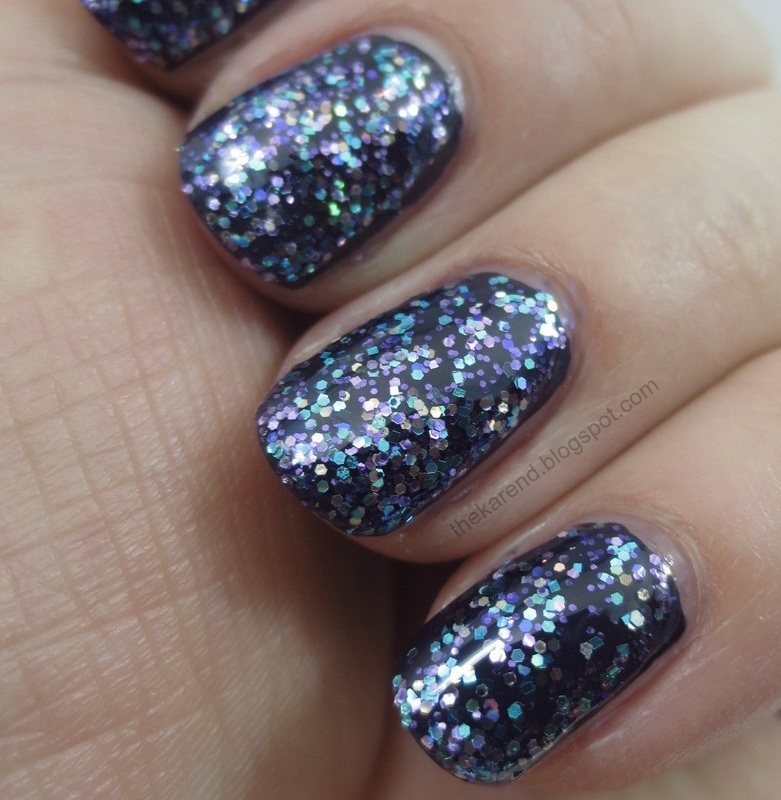 Dance Legend Spacecraft made the cut because I've been looking for a rich black holo since I missed the original OPI My Private Jet, and Spacecraft fit the bill quite nicely (it's second from top in the photo below). 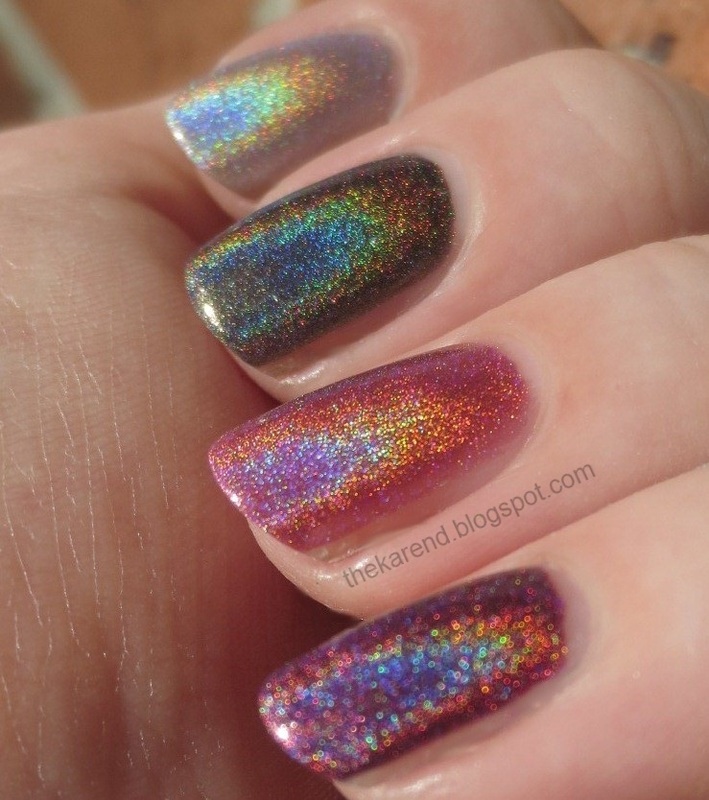 FNUG Futuristica won its spot by being more holo than any of my other light blue holos; in the photo below it's on the left, throwing the most rainbows of any of the quartet (others are from Layla, Color Club, and China Glaze). 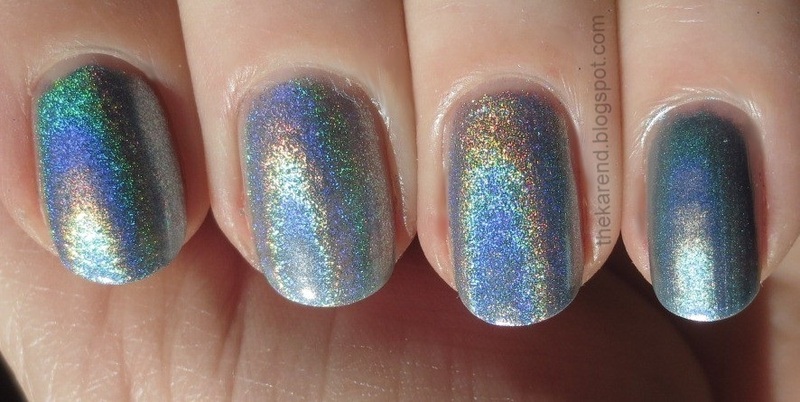 Smitten Polish has been doing some outstanding holos, so it was hard to pick a favorite among them. 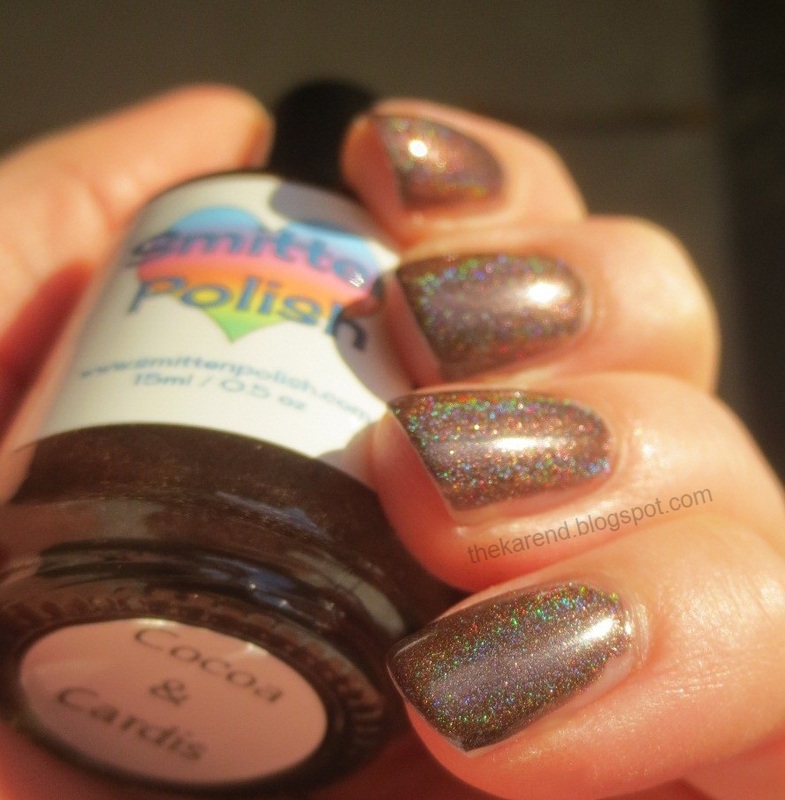 I decided on Cocoa & Cardis because brown holos aren't very easy to come by. Of course the single biggest category on my Top 20 is glitter, with seven shades making the list. Polish Revolution F'ing Classy has so many of my favorite colors in it and is just the thing to jazz up all those purple and blue and teal and other cremes in my stash (in the photo it's livening up Alessandro Blue Nuit). 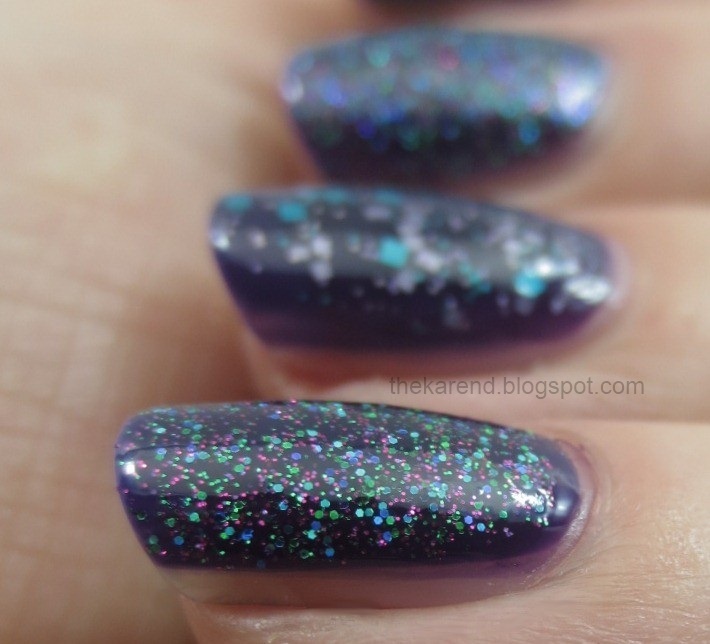 Some might say that Nail Pattern Boldness Elderberry is too similar to F'ing Classy to have both on the same list. Those people would be wrong. Elderberry would work over the same range of colors, sure, but it's got a quieter personality, which sometimes is just the thing. It's worn over Nail Pattern Boldness Tyrian Purple in the photo below. 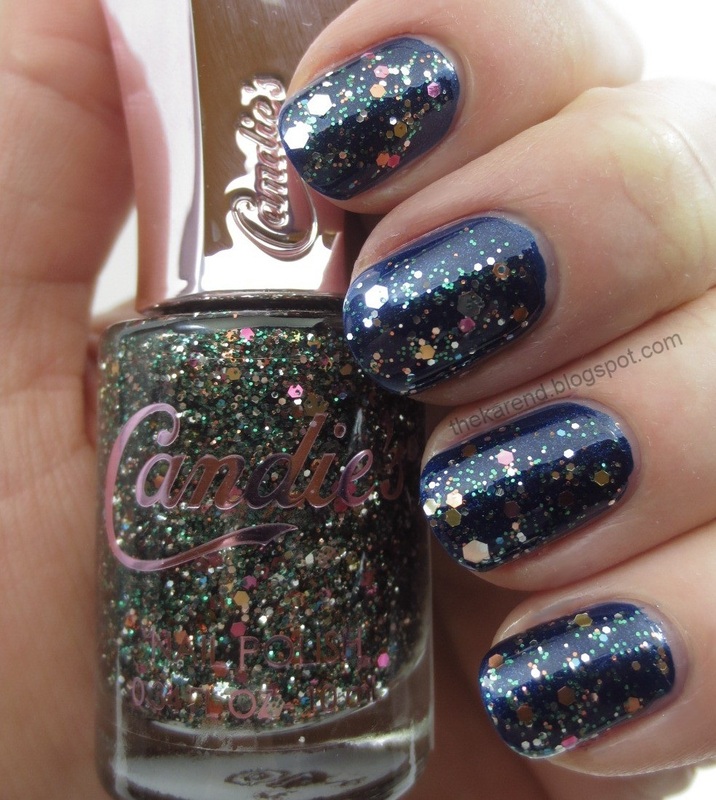 Candie's Over the Rainbow survived the battle of the glitters to make it into the Top 20 because it's a got an interesting mix of colors: silver, gold, copper, pink, and green. Wet 'n' Wild After Party from the holiday collection is the closest thing in my stash to Over the Rainbow, but the Wet 'n' Wild's color palette is less focused. I picked Shimmer Jennifer out of the lovely glitter mixes I tried from that brand using my "when it doubt, pick the most purple one" guideline. There's a lot going on here with color, shape, and sizebut it all works together so beautifully. The custom glitter topper from I Love NP that I commissioned for the lacquer lovers' weekend in Las Vegas will always remind me of the fun time I had hanging out and shopping and touring Sin City with mrsrexy and the other ladies. And I won't be able to look at Candy Lacquer Mickeys and Mistletoe without recalling the trip Mr. Karen and I took to Walt Disney World when all the Christmas decor was up and we went to the party in the Magic Kingdom and a special event at the Osborne Lights and so many other fun things. Texture was the big trend in 2013, so of course I have a couple on my list. 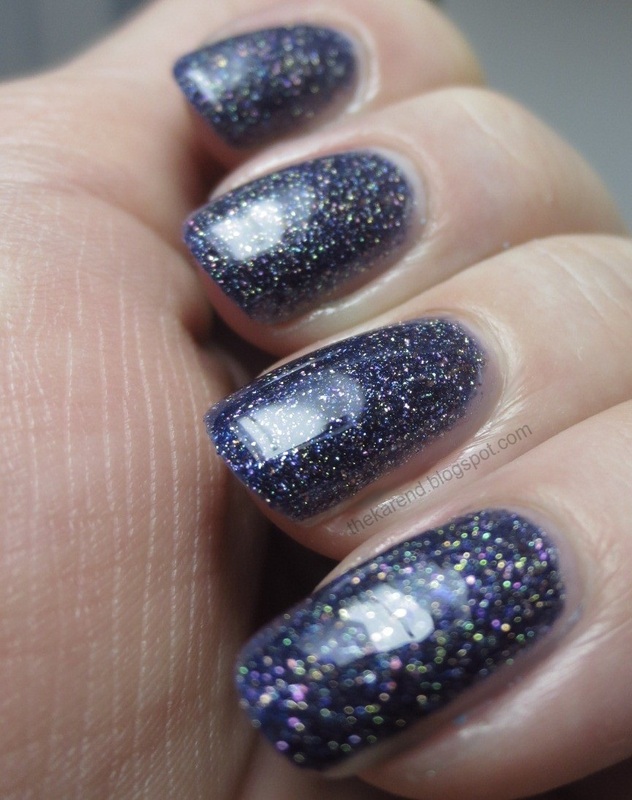 OPI Alcatraz Rocks made it on the strength of its multi-colored glitter and the fact that it looks good both with and without topcoat. Sure, it's a dupe for a P2 texture, but most of us here in the U.S. couldn't get the P2. 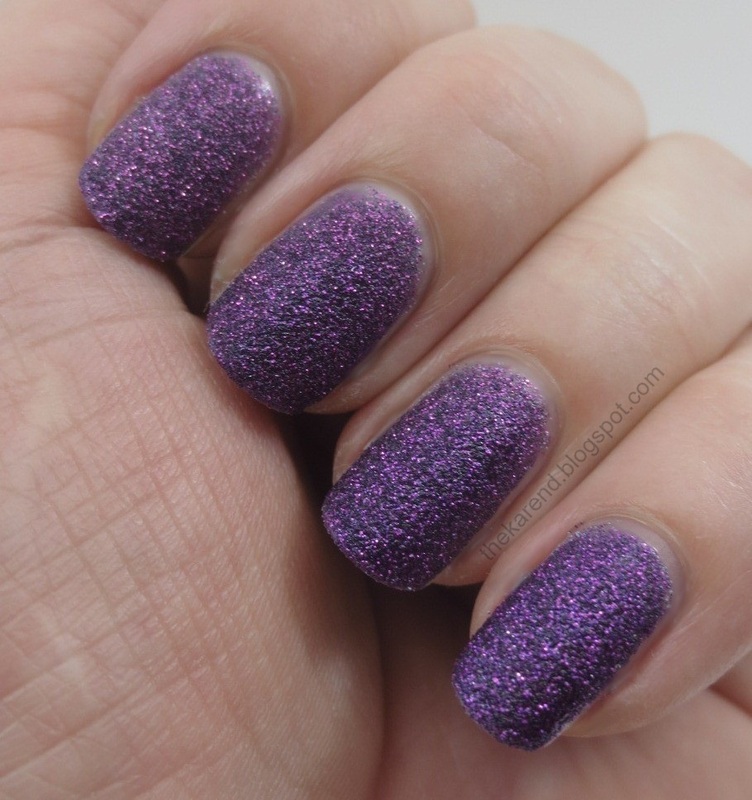 Zoya Carter got the other textured slot on the list because it's the richest purple texture in my collection. 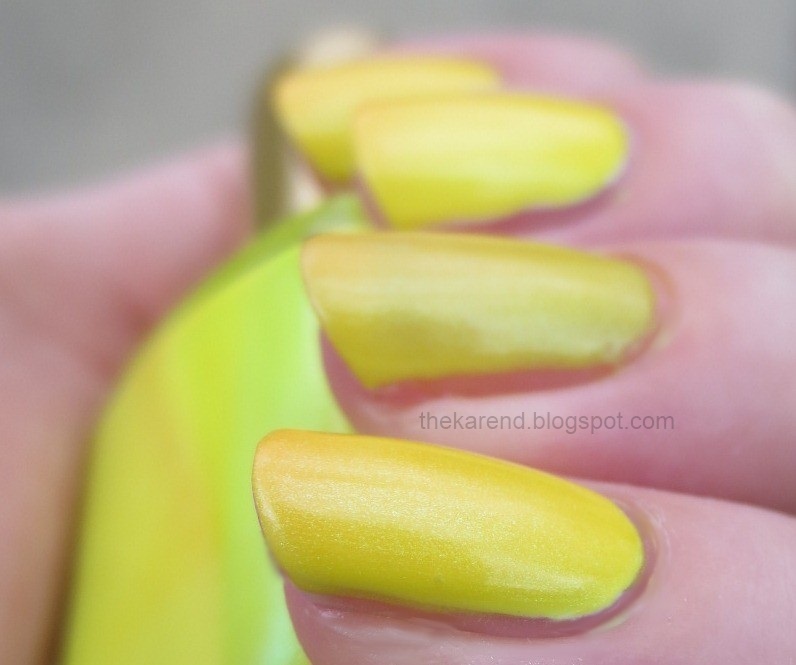 Matte was another 2013 trend, which I indulged in by buying every matte topcoat I came across. The winner was OPI Matte Top Coat, because it's a true matte finish but not chalky and goes on very smoothly. If the Sally Girl matte topper were part of the permanent line, that would have given OPI a run for this spot on my Top 20. My previous lists, with links to the blog posts, are all on my Top 20 page. If you did a Top something (10, 20, 7, etc.) post for 2013, feel free to link it in the comments. Some of the polishes shown in this entry were provided free for review purposes (you can see which ones by following the links to the individual entries). The content of this entry was not dictated by the providers. Great choices! 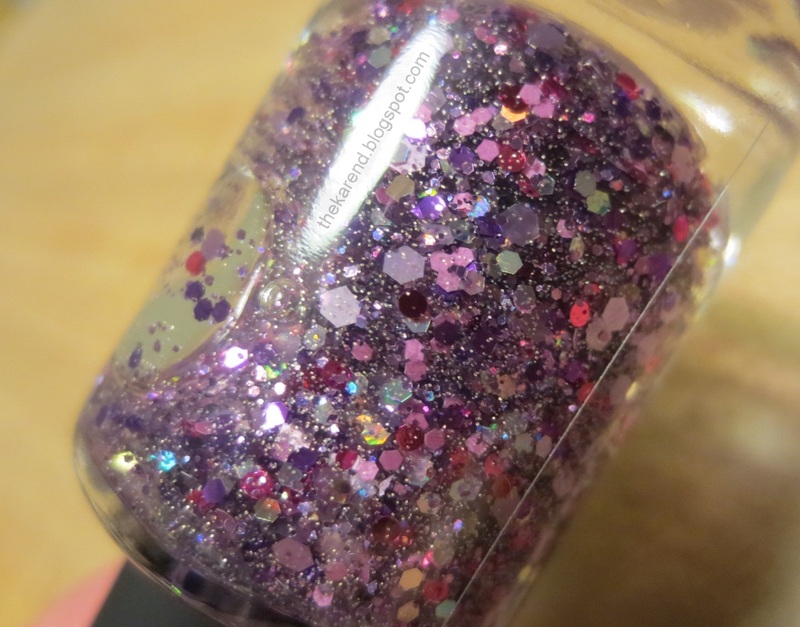 I especially love the glitters by Candy Lacquer and I Love Nail Polish, which is totally up my alley, since I'm all about purple. Oh and Shimmer Jennifer is great too. I have that one and totally need to wear it. So many lovely polishes! Great top 20! 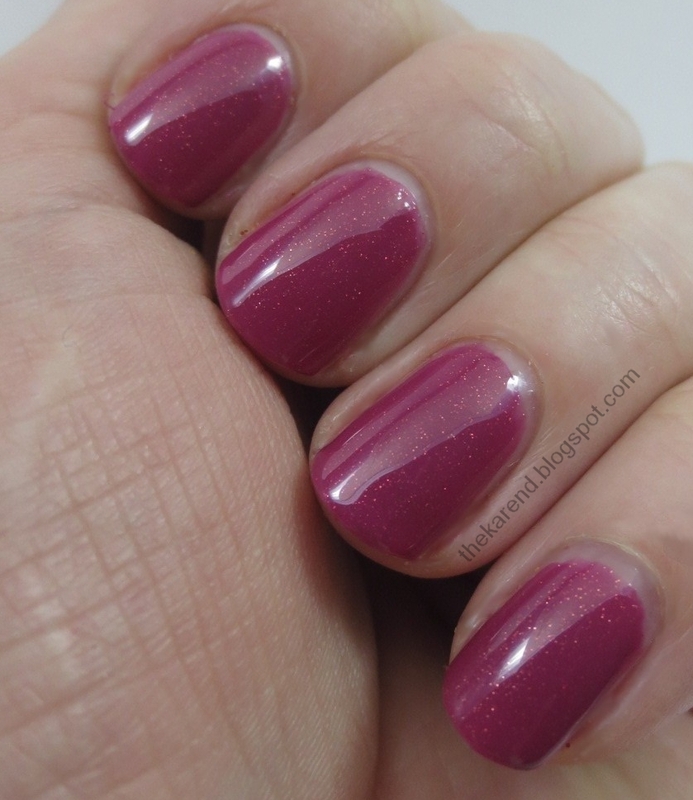 So many truly beautiful polishes - this is a great post! Oooh good to know about SinfulShine Wisp! I just finished a bottle of Whirlwind White and only have two backups left (lol only...) I'll never understand why SH discontinued such an awesome white polish! Alcatraz Rocks and Carter are the only ones I have off your list, but there are some amazing ones on there!